Strabismus is a visual problem in which the eyes are not aligned properly and point in different directions. One eye may look straight ahead, while the other eye turns inward, outward, upward or downward. The eye turn may be constant, or it may come and go. Which eye is straight (and which is misaligned) may switch or alternate. Strabismus is a common condition among children. About 4 percent of all children in the United States have strabismus. It can also occur later in life. Strabismus occurs equally in males and females. It may run in families; however, many people with strabismus have no relatives with the problem. The exact cause of strabismus is not fully understood. In some cases, strabismus may be due to problems with the muscles controlling eye movement. Six eye muscles that control eye movement are attached to the outside of each eye. In each eye, one muscle moves in the eye to the right, and one muscle moves the eye to the left. The other four muscles move it up or down and at an angle. To line up and focus both eyes on a single target, all of the muscles in each eye must be balanced and working together. In order for the eyes to move together, the muscles in both eyes must be coordinated. The brain controls these muscles. With normal vision, both eyes aim at the same spot. The brain then combines the two pictures into a single, three-dimensional image. This three-dimensional image gives us depth perception. When one eye is out of alignment, two different pictures are sent to the brain. In a young child, the brain learns to ignore the image of the misaligned eye and sees only the image from the straight or better-seeing eye. The child then loses depth perception. Adults who develop strabismus often have double vision because their brains have already learned to receive images from both eyes and cannot ignore the image from the turned eye. A child generally does not see double. In some cases, strabismus may result from problems in the brain. Sometimes, a child’s brain may not be correctly combining the two images it receives from the eyes. In rare cases, a tumor may affect how the brain processes visual information. 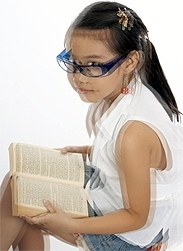 Often children experience strabismus as a result of problems that can be easily treated with glasses.